For those of you who have been following along in our journey with our son Scott, you’ll know that we placed him in public school in September — a month after school started. (You can weed through the posts I tagged with Scott here.) He was been diagnosed with Pervasive Development Disorder (Not Otherwise Specified) also known as PDD (NOS). Despite the fact that he does not have autism, this year, PDD (NOS) was placed under the autism “umbrella” and technically falls into that spectrum. 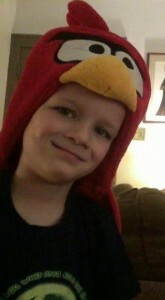 The only way that affects us is as far as funding for his school goes, and it’s a positive there. I have really seen a lack of effort the last few weeks. He is having to redo work, and have an teacher sit individually with him to make him finish. I am concerned about first grade because there are no assistants to take time way from the other students to make him work. I foresee him getting into more trouble as the quantity of work increases. I am having a difficulty testing him as well. I simply can’t tell if he’s struggling in math and reading now, or if he doesn’t care to answer my questions correctly. The day after that, I had to drive him because it was really cold and rainy. The report that day was not good. A pattern was emerging. Now, we walk rain or shine. It takes us 25 minutes to walk when I don’t have to drag him, and 20 minutes if he’s really keeping up a good pace and not trying to stop and look at something along the way. I give us a 35-minute window in case we see another headless rabbit or something. It’s been 3 weeks since that email and two weeks since the ARC meeting. 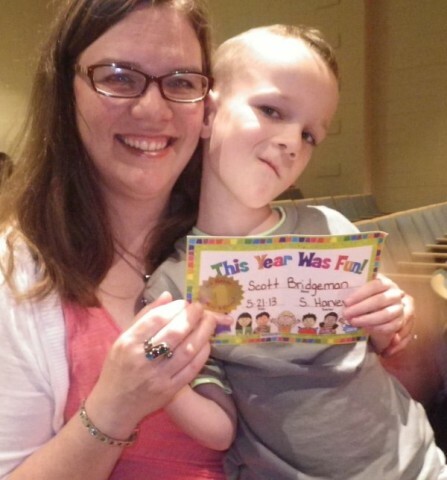 Retention was discussed but dismissed, because Scott is SO SMART, and the standardized testing scores that came in the mail right before the meeting showed him to be “high average” in testing. The special ed teacher at the meeting said that his scores would have been much higher if he’d tested on one of his cooperating days, because she administered him his test and knows what he knows and what he was just unwilling to show. At the meeting, we developed a plan for next year that includes walking despite any inclement weather (we will be investing in rain coats and rain boots!). Yesterday, he received his promotion certificate. He is now “officially” in the first grade. More than likely, homeschooling will be back in our radar in the future. But, for now, we’ll keep him where he is while I continue to learn from trained special education teachers how to teach Scott. I’ve already learned so much this year from the occupational therapist and the special ed teachers, and I realize in hindsight how unequipped I was to homeschool him. You’re onto something. That is a great plan. And if you should ever decide to homeschool, as I did, take full advantage of the opportunities for enrichment for gifted students like Scott. Partnership with your school district is a win/win! They are the professional educators and specialist incidentally a bit crippled by a broken system, And you are the professional, called, equipped, and anointed mama of Scott! I can’t think of a better team to ensure Scott’s success! Way to go, what a breakthrough. That’s awesome Hallee! I’m so glad you found something that gets him excited for school. Amazing news! I’m so glad you’ve found this bright spot for him! It’s amazing what knowing a child’s “currency” can accomplish for them. I’m happy to read this! I don’t think you’re unequipped as much as you think you are. You found the key to his success. You’re doing a great job! Great news! I think a walk to school would help a lot of kids, really. I know I feel better when I run before I go to work. 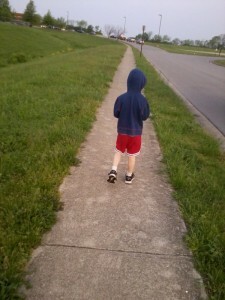 Mia’s school in the fall is not a mile away, but walkable and I plan to walk with her too. What an awesome update! I have learned along the way that large joint compression produces serotonin which produces a calm demeanor (think runner’s high – but not to that extent). You definitely hit something with the walk to school in the morning! Well done, Hallee! Hallee, this update brought tears to my eyes! I am so glad there has been a break through with Scott this school year. I am sure your heart is praising the Lord right now! Who knew walking to school would be beneficial to Scott on so many levels?! Way to go, Scott!!!! The occupational therapist suggested we try to get some really tight fitting undershirts – like Under Armor – to give him some joint compression. If he’s incredibly antsy and hopping around or unable to speak because he’s so charged up, we’ll fold him in half and squeeze him – bring his knees up to his head — that REALLY helps. Which is why we thought a walk to school might do the trick. We’re considering getting a mini trampoline for the days that a walk just isn’t going to happen. Both boys will be in the same school next year, so they’ll both we walking. I don’t see how a mile of exercise, fresh air, and sunshine could be bad. My thought was, it can only help. You can push for an assistant that is assigned to only him. The school MUST provide one. My friend has a son that had an assistant at Fanny Bush for the whole 5 years he was there. For now, he’s going to have someone check in on him for the first 15 mins of every hour. If it seems like he needs more invasive help, then we’ll readdress it. That’s fantastic! So happy to hear that he is doing better and seems happier with school. One step at a time!! :) Thanks for sharing! My heart sings for you and your family!!! I’ve been to your site a few times but have not been able to really read through your back stories about Scott and such but yeah! God is so good. What challenges you’ve obviously faced and gotten through:) Just keep loving him and listening to God. So glad to hear that Scott (and all of you!) had a breakthrough! Ahh, ok. I just remembered something about my own kids and the walking somewhere before arriving at x,y,z. I really think you had a breakthrough too. Marion use to walk to school, but now that we drive there she gets more whinny. Eliza just started going to a new babysitter and everytime I drop her off via car her separation anxiety is way worse, but if we walk there the separation is fleeting. I really truly believe physical exercise and movement is so key for all young kids. This is why I think we get different results with TV versus no TV and our preschool director is adamant that young kids learn through physical touch, motion, etc. This is great Hallee. I think all Scott needed was to feel that time and the energy output to “make sense” of going to school and by the time he has gotten there he has worked out most of his anxiety and fears. Also plenty of learning opportunities even if it is a headless rabbit :) Way to Scott . I am so proud for you all! Oh Hallee, I am rejoicing with you. This is such great news! One little mile making all the difference! Congratulations to Scott! What a lovely ending to this chapter. Each year will have its challenges, loving parents (and the hand of God) have brought this act to a lovely end. HUGS TO YOU HALLEE! !